The absence of gender equality has been widely reported in Armenia not only at home, but also in the workplace where women’s prospects of employment and earning are far lower compared to men. Gender inequality is most evident in rural areas, where the prospect of employment is even lower, and women are even more vulnerable due to a lack of access to services that encourage gender equality and provide additional resources to support women at-risk of domestic violence or other forms of abuse. In December of 2017, NEF UK launched a new project – funded by the European Union – that will strengthen the capacity of local civil society organizations (CSOs) to provide services focused on improving gender equality and women’s economic empowerment in rural Armenia. These efforts build onto NEF UK’s recent work in Armenia that helped at-risk women start their own businesses and secure financial independence, while also working with CSOs to advocate for protections for survivors of gender-based violence. NEF and its partners have found that through financial independence, women gain empowerment and the respect of their families and communities and, in turn, experience reduced violence or hostility in their homes and workplaces. As such, NEF remains committed to continuing to advocate for policies and systems that support and empower women in Armenia. Many Armenian CSOs, including those that advocate for women’s rights and help women and children at risk, are heavily dependent on donor or government funding to operate. This means that they cannot plan their work in the long term, and during some periods they may not have the means to continue supporting women in need. NEF UK’s two-year project in partnership with the Women’s Development Resource Center Foundation (WDRCF), will seek to change this. The project will support 12 CSOs in Aragatsotn, Gegharkunik, Lori and Syunik Marzes to launch or further develop social enterprise activities that will fund programs that benefit women in their communities in a variety of ways. The CSOs will be trained on business operations that will directly support their work to raise awareness of women’s rights and economic empowerment. Ultimately the project will ensure the ongoing operation of CSOs supporting women’s economic empowerment and gender equality in Armenia, benefitting the lives of all those reached by those organizations. Of the CSO’s participating, Ms. Baghdoyan says, “Selected CSOs are those established based on community needs, and now they will be able to highly contribute to solution of those needs such as providing job opportunities to women.’’ The CSOs who will benefit from the project look forward to greater financial and organizational stability in the coming years, allowing them to continue their important work. 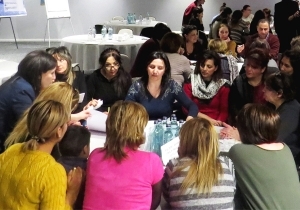 Along with supporting over 600 vulnerable women (particularly survivors of gender-based violence and women at risk of gender-based violence), NEF UK’s efforts will also engage with a number of market actors and CSOs across Armenia to promote gender equality and women’s economic empowerment. Click here to learn more about NEF’s work in Armenia.